Differentiating between pessimist vs. optimist investors is best defined by the saying, “A pessimist is an optimist with experience.” An optimist is hopeful and confident that things will turn out for the better. On the other hand, a pessimist always keeps in mind the possibility of the worst outcome. An optimist’s positivityInterpersonal IntelligenceInterpersonal intelligence refers to the ability of a person to relate well with people and manage relationships. It enables people to understand the needs and motivations of those around them, which helps strengthen their overall influence. People with interpersonal intelligence keeps him energized while a pessimist’s negativity keeps him prepared should the need to counter risks arise. The finance world is populated by pessimist vs. optimist investors. An investor with zero pessimistic tendencies may soon come to realize that investing is more than just optimistic bettingLong and Short PositionsIn investing, long and short positions represent directional bets by investors that a security will either go up (when long) or down (when short). In the trading of assets, an investor can take two types of positions: long and short. An investor can either buy an asset (going long), or sell it (going short).. Through a gradual process and with experience in unprofitable trades, optimists may realize that research and time in the marketStock MarketThe stock market refers to public markets that exist for issuing, buying and selling stocks that trade on a stock exchange or over-the-counter. Stocks, also known as equities, represent fractional ownership in a company may be more important than timing in the market. 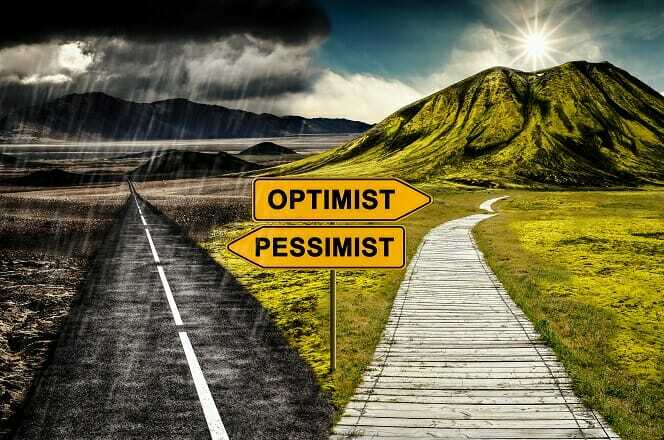 The optimist develops pessimistic tendencies over time as a heuristic against overconfidence and hopeful wishing. However, being overly pessimistic will keep an investor isolated due to fear, which may sometimes be irrational. Trying is the best way to move forward, and failure is the road to success. Thus, to be successful in investments, neither of the two principles should be ignored nor over-relied upon. The best way to become a successful investor is to be an optimist while applying a pessimist’s strategies. Business undertakings are surrounded by uncertainties that make it hard to operate without some degree of confidence. A great investor does not attribute success purely to hope, but she will always keep a healthy dose of it while taking the necessary steps to lessen risks. Again, an investor that is too optimistic or hopeful may fail, but an investor that is too pessimistic may not even manage to begin their trading. Here, it’s all about a balance. Wise investors know that information is power, and freely available information may not offer them any competitive advantage. As such, they are ready to pay professionals for their best recommendations. Note here that there is such a thing as an unethical acquisition of premium information, namely in the form of insider tradingInsider TradingInsider trading refers to the practice of purchasing or selling a publicly-traded company’s securities while in possession of material information that is, which should be avoided at all times. Experienced investors are aware that the game involves losing money once in a while, and do not let setbacks keep them from trying a second time. Keeping a stream of investments in various industries is a proven and more reliable method to good investing. Diversification is key, and is, in fact, in line with a pessimistic mindset. The pessimist knows that industries will always experience downward swings, and so she diversifies. They realize that not all options will succeed but are sure that not all will fail, too. They are ready to learn from mistakes and improve over time with hands-on experience rather than trying to learn the rules while out of the game, as in the case of a strong pessimist. They are less prone to giving up after a setback as they take each scenario as a learning opportunity rather than an all-or-nothing battle. They may abandon a successful investment at the expense of mitigating negative emotions even when the odds are in their favor. They are risk-averse and perfectionists: they need to know every step the investment will take before committing their dollar. Bearing in mind that the markets require fast action takers, pessimistic investors lose more opportunities than optimistic investors. They over-rely on historical data. Thus, even when the market is on an upward trend, they may still be hesitant to invest if the path is unclear. They are likely to be stressed from a loss as they tend to think they should be profiting from every investment they engage in. They only like to act on thorough knowledge. These investors are not willing to get into a venture without a clear outline of what is involved. They only risk what they are ready to lose as opposed to optimists who tend to take into account the loss of not going for certain opportunities. Are optimists rewarded in the market? Before we answer that, we are going to look at a scenario where one party thinks everything will go wrong, creating hedging strategies and plans in case of the worst. The other party is entirely optimistic, and after casting the net, they sit and wait. If things turn out positively, the optimist will be at more of advantage compared to the pessimist since they’ve spent fewer resources on the purchase, paying little to no hedging expenses. However, if things go wrong, the optimist will possibly lose everything, and the pessimist will be in a better position. Wealth is built on what you save rather than what you make. Thus, if you make a lot of money but leave it exposed, it will not last or it may be taken by other market forces. So, in such a case, the market rewards pessimists by giving them a second chance. The pessimist and optimist can both thrive in the business world because they need each other to sustain the market. If everyone were profiting in a single sector alone, all other sectors would exit in favor of that profiting sector. The same goes for businesses in the realms of optimism and pessimism. The optimist invents, but the pessimists give longevity and sustainability. One company manufactures aircraft while another makes parachutes. In the stock markets, two forces reign. The two forces are the bear market and the bull market. The bear market is characterized by pessimism and lowering prices, while optimism and increasing prices characterize the bull market. From historical data and records, there is no one time the bear market was able to suppress the bull market in the long run. The two are in constant swing between each other. The market movements can also be characterized as a constant engagement between pessimist vs. optimist investors. Herein lies the strength of the belief that “A pessimist is an optimist with experience.” In a bear market, a strong pessimist may sit entirely out of the market and refuse to buy in. A strong optimist may be too hopeful and buy while the market is still trending down. The investor in the best situation is the one that marries the two outlooks. An investor with an optimistic mindset that the bear will eventually become a bull will have the resilience and patience to ride the market out. The same investor, having experienced failed trades in the past, takes the pessimistic strategy of hedging her bets.